What a was devastating development! When I heard the news this morning that the US Government had shut down as of October 1, 2013, I was concerned. However, I had no idea that the contingenicies of this shutdown would affect me so severely. All of a sudden, all US National Parks have been closed. 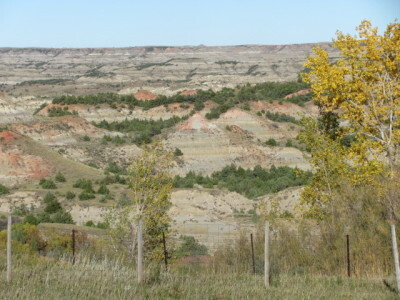 We are headed for Theodore Roosevelt National Park in western North Dakota. What will we do? We then plan to drive to South Dakota to see Badlands National Park and Mount Rushmore. The remainder of our trip has suddenly been sabotaged. All the way across Minnesota and North Dakota we discussed what we should do. I couldn’t believe that my road trip was ruined. 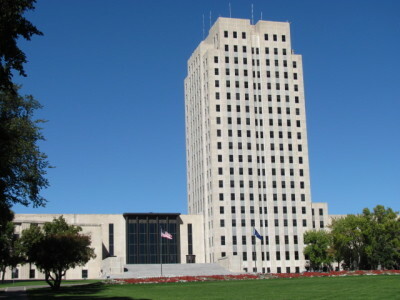 To try to salvage a bit of something we stopped in Bismarck, North Dakota to see the State House, affectionately known as the “Skyscraper of the Prarie.” It was pretty interesting. The Art Deco building stands tall above the landscape. 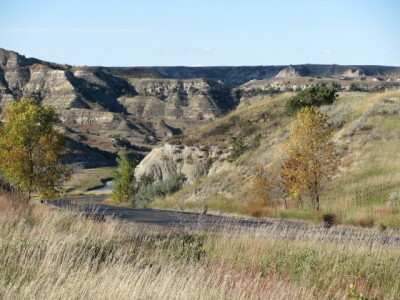 Lee then suggested that we check out Teddy Roosevelt National Park before dinner just to get the “lay of the land.” I took this picture of the badlands on our way to the park entrance just to suggest what we might have seen. When we arrived we found that we actually could enter the park and drive the loop road. The sign at the entrance said that the park was closed but the road remained open for “through traffic only.” The Visitor Centers were closed of course, but at least we’ll be able to sample the park. We actually drove a bit on the loop road just to be sure. We will return in the morning to complete the loop.